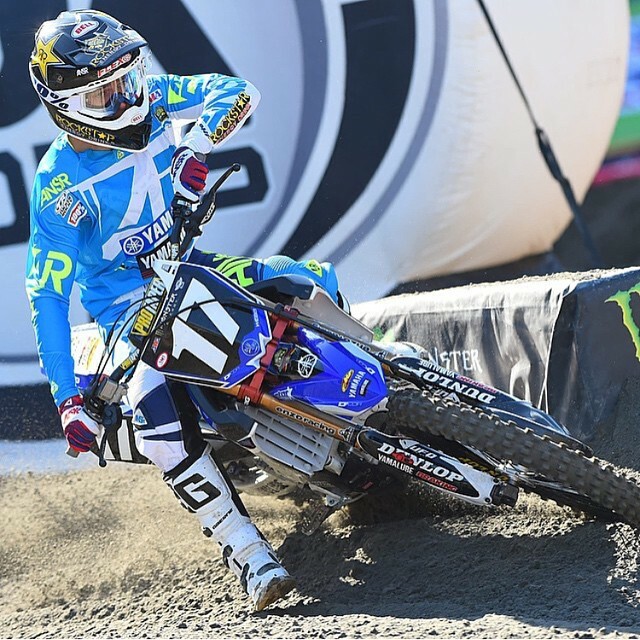 South of the Border Motocross Training Facility to Host Cooper Webb Feb 11-13, 2015.
Cooper Webb, AMA Pro Racing Rookie of the Year for 2014, will be making the trek to South Carolina from California to teach a 50/65/85cc school at South of the Border Motocross Training Facility. 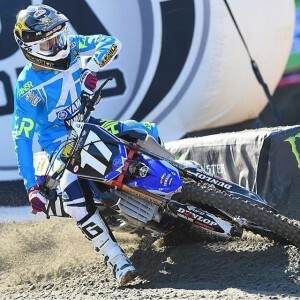 Cooper will be on a break from the West Coast Supercross series and will be hosting and coaching the class on February 11th, 12th, and 13th. The price for this three-day class with Cooper will be $525. The class will start at 10:30am each day and go until around 3:00pm. All aspects of riding technique and racing will be covered, as well racing strategy. Cooper and his father Bob will be available all three days to answer any questions about racing at the amateur and pro level. This class will be limited to twelve riders. For information on how to reserve your spot, please e-mail info@sobmx.com. Don’t miss out on this opportunity to train with Cooper, you will learn a lot and have fun as well. 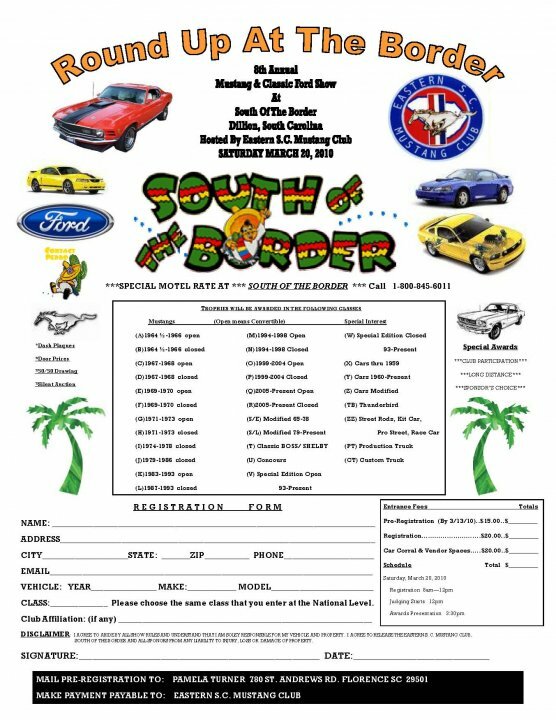 On March 20, 2010 South of the Border will be hosting the 8th Annual Round Up at The Border car show, bringing in Ford Mustang and Classic Ford auto enthusiasts from all over the East Coast here to Dillon, South Carolina. Each year the show gets bigger and better, and this year should be the best yet. The Round Up at The Border car show is a must-attend event if you love the classic good looks of a true American automotive icon like the Ford Mustang. You can see a fantastic video of a previous show, posted by the Southern Mustang and Ford Club. 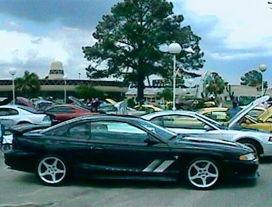 The Round up at The Border is hosted by the Eastern South Carolina Mustang Club based out of Florence, South Carolina. All models of Classic Ford cars are welcomed at this event, and there will be many different classes to choose from for Mustang owners. Door prizes will be given away all day during the show so make sure you register to win, even though Pedro always thinks you are a winner. The show will begin at 8AM and continue until 4PM. You can check your hot-looking cars in from 8AM to Noon. The registration fee is only $20, but you can get and Early Bird discount if you register before March 13th. To get your registration forms you may contact Gene Turner at gtmustang@bellsouth.net or give him a call at 843-617-1456. Pedro is also helping you out at this event with a good deal at the South of the Border Motor Inn. If you would like to stay over or come a day early, simply give us a call at 800-845-6011 and mention that you would like the special rate for the Round Up at The Border show. We also have full camping sites available with room for even the largest RV’s. There is also plenty of parking on the South of the Border complex for trailers and car haulers. And of course, no trip would be complete without some trinkets, collectibles or kitsch from one of our many shops. 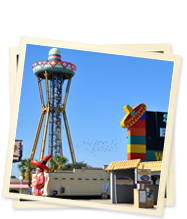 There are 6 different dining options at South of the Border ranging from the high-end steak house The Peddler to Mexican food at the world famous Pedro’s Hot Tamale. Location: “Pedro’s South of the Border” on I-95 at the North Carolina South Carolina border. Event time: 8am – 4pm; check-in 8am- noon. Registration Fee: $20 ($15 before March 13). 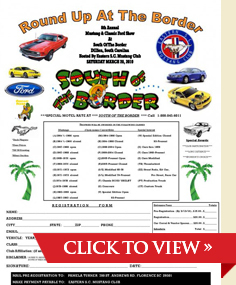 Door prizes, classes for all models of Mustangs and Fords, special motel rate with South of the Border. Contact: Gene Turner at gtmustang@bellsouth.net, call 843.617.1456. We encourage everyone to drive safely on your trip to Dillon, SC and we will see you on March 20th for the 8th annual Round Up at the Border here on the grounds of America’s Favorite Roadside Attraction, South of the Border.